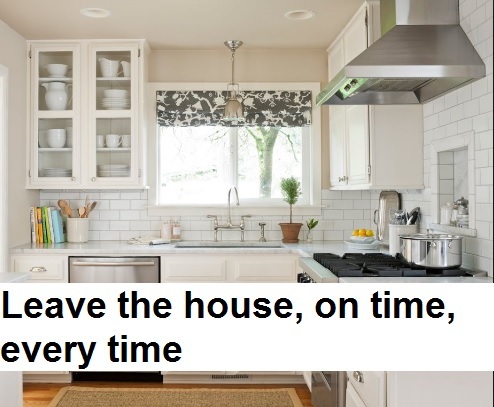 Leave the house, on time, every time! I don’t know about you, but I find it easy to run late if I’m not organised. I worked with a client recently to help her get organised. Her biggest gripe was that she was always running late. Late to work. Late to pick up the kids. Late to visit friends. Late with dinner. And she wanted to fix this problem. I know myself, if I’m not organised then I am guaranteed to run late. So I could totally understand where she was coming from. So here’s my tips to help you get out the door, on time, every time. What time you need to leave to get their on time. Consider if you need to allow extra time to park or if you will hit peak hour or school traffic. Do you need to get petrol on the way? Then allow an extra 10 minutes, as a buffer. So if you had planned on leaving at 9.15am aim to be in the car at 9.05am. Easy! If you are taking the kids then ensure they know what is expected of them in the morning. Explain the night before, that they will need to be up at a set time in the morning. As I mentioned above, factor in a 10 minute buffer zone. I’ve got little kids and it never fails that as soon as you are ready to get in the car, they do a poo. So their nappy needs to be changed. And, if you’ve got big kids, they still need to be managed too. How long does it take to do one’s hair? Do you really need to be snap chatting or texting at 8am in the morning! Most teenage kids only know one pace. Dawdle! Plus some kids are just not morning risers. So you need to plan for this. Explain the night before what the deal is. What time they will need to be up in the morning. And then stay one step ahead of them by calling them 15 minutes earlier than required. Each night I work out what I am going to be wearing for the following day. It’s out, ironed and ready to go. Then, there’s no procrastinating in the morning about what to wear. If you want to be super organised, plan your wardrobe on Sunday. Iron and hang it some separate so you are organised for the entire week. Easy! I do this for my kids as well. So, then I’m not running around trying to find their clothes in the morning. Plus it avoids arguments. If they are at the stage where they want to dress themselves, then get them involved. Get them to choose their own clothes the night before. There’s nothing worse in the morning. You’re now running late. You’re screening at the kids to get in the car and you realise your daughter is dressed like a bumble bee! Have one spot where your keys and phone get put. Perhaps you need to hang a hook inside the front door. Or set up a “drop zone” somewhere in your house where your keys and phone are put religiously. Is it in the top draw in the kitchen? A bowl setting on the bench. Or on the hallway table. Basically whatever works for your home! I find this really useful, especially if you have to get kids organised to. Get up, get yourself organised and perhaps even have your breakfast first. You want to avoid shoving cold toast in your mouth as you run out the door…running late again! The Lifestylers Group is a professional organising and decluttering service, based in Melbourne and assisting clients in Melbourne, Sydney, Brisbane and Perth.